For my birthday I received the TFA Nexus Pro from my fiancee. 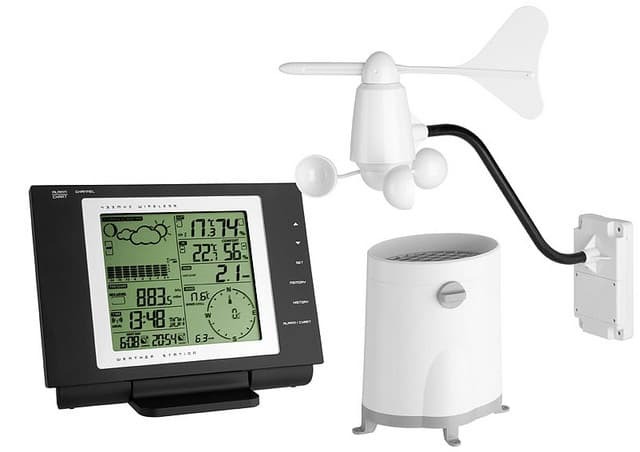 A very nice weather station with a fair price. Perhaps not the best weather station for true weather addicts but more than enough for me. It has a memory for 3000 weather items. You can read the memory by connecting the weather station via a USB cable to your personal computer. But if you want to save the weather data for later use or perhaps you want to display your current weather (near) realtime your personal computer needs to keep running 24/7. But I also have a NAS system that is running 24/7 already and I wondered perhaps I can connect the weather station to my NAS server. And yes I can. My NAS server is from QNAP but this also works for a Synology NAS server and perhaps other as well. For the QNAP you must install the “Optware IPKG” package first. You can do this by logging in on the Web interface and go to “Application Servers” -> “QPKG Center” and then installing the “Optware IPKG” from the available tab. For the Synology you need another procedure that is explained on the synology website. For a Thecus NAS you can follow this guide for installing Optware on your NAS. Afterwards connect with SSH (for instance with PuTTY) to your NAS server and login as the administrator user. Next download and unpack the te923tool from Sebastian John. Now you should have a file called te923con in the same directory. Let’s copy it to a different directory. Now it is time to connect the weather station to the NAS server with the supplied USB cable. Please note: This may break other USB devices connected to your NAS for instance if you have a USB keyboard connected to your NAS. If you don’t or if you know what you are doing feel free to execute this command. -  Unixtime - Current date / time in a unixtime stamp format. In this case for instance the inside temperature is 16.95 degrees Celsius. The inside humidity is 49%, the outside temperature is 9.9 degrees Celsius and outside humidity is 78%. The pressure is 1027.6 and it is expected to remain sunny (which is indicated by the 6) for the next few hours. Hurray you are now able to read the values from your weather station from your QNAP or Synology NAS server and possibly any NAS server that supports the Optware ipkg. Please note that this tool works for most weather station based on the Hideki te923 chip like the TFA Nexus Pro, Mebus TE923, Irox pro, Honeywell TE923, MeteoScan Pro 923, Cresta 923 and perhaps others. Next up is saving the data in regular intervals to a MySQL database. is the installation before not complete or did i something wrong. No this a linux kernel thing. Solution depends on whether you have a QNAP, Synology or other brand NAS. Or a own build linux box. And also on which version you run of the software (like DSM) that the NAS company provides. Perhaps the command ” /opt/bin/te923con -i0″ works anyway? My NAS is synology 212+ and DSM at this moment 4.2. The command:/opt/bin/te923con -i0 did not work at all. Seems like a few people have trouble with the usb driver on DSM 3.x and above. Unfortunately I do not own a Synology NAS anymore so I cannot debug this. Just did a recalculation of the Rain factor. 1 switch on the rainsensor equals 5ml on a surface of 0.00688m2, this means 726,7349ml/m2. the output to the database is 1 per switch. 1 switch = 0.726735mm per m3, means you have to multiply by this number. Has there been any update on the above in the meanwhile? Have a Synology NAS at home and am planning on buying a weather station that connects (well) to my nas server. Am not an IT guy. i have no option “QPKG Center” under “Application Servers” section. Do you still have that option?